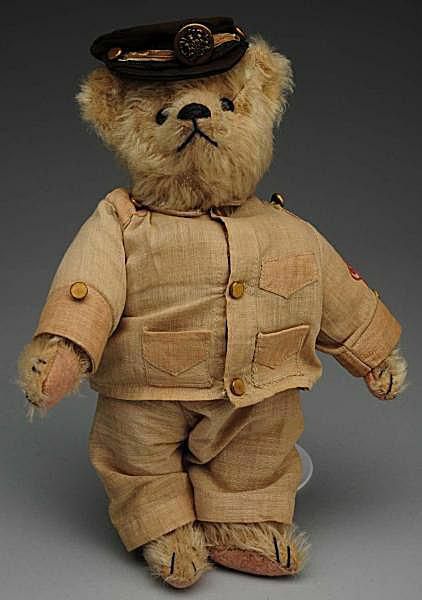 Steiff began producing stuffed animals in Germany in the late 1800s but didn't gain wide recognition until the company's famous "Teddy" bears were first manufactured in 1902. Since then, myriad bears and other high-quality animals crafted from plush mohair have been produced, and the company is still doing business in Giengen/Brenz, Germany. This price guide is designed to help you identify and value Steiff animals. The values provided are for animals in similar condition to the one shown in the photo. For the most up to date information on Steiff selling prices, be sure to check a number of online selling venues such as Ruby Lane, Morphy Auctions, and do completed item searches on eBay. Learn more about pricing antiques and collectibles reading Valuing Antiques: Concerns About Condition and 10 Rules for Valuing Antiques Like a Pro. This bear is tan in color with a nice face, shoe button eyes, sewn nose, and mouth, shaved muzzle, long arms and legs, sewn claws, felt paw pads and original "Teddy B" tan cotton suit with brass buttons and hat. Some fur loss, but overall condition is very good. Measures 10" tall. This doll is all felt with center seam molded face, shoe button eyes, pink cheeks and mouth, light mohair wig (sparse in back), jointed shoulders and hips; knitted sweater, pants, and socks that appear to be original. It has light overall soiling but is considered good for this desirable doll. Measures 13" tall. This doll has a vinyl face, mohair beard, stuffed cloth body and original red Santa suit. Steiff button with yellow tag reads "#7966/38 Made in Germany". The condition is good. Measures 15" tall. This Steiff tiger was made in a number of different sizes, and values vary significantly according to size so be sure to research values appropriately. No markings on this example. ​The condition is excellent. This jointed 9" dog has short mohair coat and shoe button eyes, stitched nose, mouth, and claws. The condition is very good even though it is missing its Steiff ear button. This patriotic bear has shoe button eyes, tan stitched nose, mouth, and claws, felt paw pads, and original blank button. The condition is very good with overall wear to mohair and pads. This doll is missing its ear button although the hole is present. It has a faded partial stamp on the foot reading "Walt Disney Mickey Mouse." Missing tail and two long whiskers near the nose. Slight soiling to face. This dog came with a ribbon tied around the dog's neck. If the ribbon is present and in excellent condition, this adds value to the animal. The condition, as shown, is excellent. This pony originally came with a red halter and saddle, which adds value when found complete. The condition, as shown, is very good. This adorable little creature is Steiff's interpretation of Perri, a squirrel depicted in a Disney film produced in 1957. It was originally sold holding a velvet nut. The value is higher if the nut is still present. The condition, as shown, is excellent. The small tiger shown here has no markings. The larger tiger has only chest tag. The condition of both is excellent. This bear is its original underscored ear button, shoe button eyes, stitched nose, mouth, and claws, and felt paw pads. The condition is very good with some mohair loss and old felt nose patch. This bear has shoe button eyes, stitched nose, mouth, and claws, felt paw pads, no button in the ear. The condition is very good with very minor mohair loss, some home sewn repairs to pads. This sheep on wheels has wool fleece with felt face and legs, bead eyes, original ribbon with bell, and gilded cast iron wheels. It is missing the Steiff ear button. The condition is very good with some loss of the wool. Lot of nine skittles with three wooden balls. All original with only minor wear. The condition is excellent. This rabbit with glass eyes has its original cloth tag on the upper left arm and brass button in the left ear. Has faded pants and right suspender break. The condition is very good to excellent (as noted by auction house). This mohair bear with blank Steiff button in ear has shoe button eyes, tan stitched nose, mouth, and claws, and felt paw pads. The condition is very good to excellent.